Flat roofing is ideal because it offers additional space to those buildings with little interior storage and space. The flat surfacing can store heavier equipment such as your HVAC unit when ground space is limited. While you can put many things up on your roof surface, HVAC units are the most commonly placed item on flat roof structures. There are pros and cons to having the HVAC unit on your roof. One of the most important benefits to having your HVAC unit on the roof is that the unit will not be an obstruction for your customers or clients. It also keeps any loud sounds the unit makes away from the public. 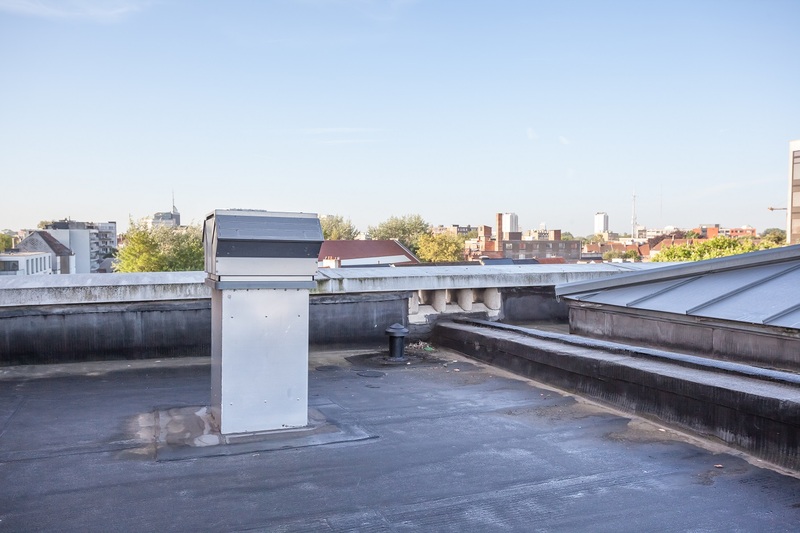 During the colder seasons, these units can turn on and off frequently, but when the noise is on the roof, it will not be a noise problem for your customers or workers. When HVAC units are on the ground floor, that means maintenance and upkeep are also performed on the ground too, which can cause major obstructions and disturbances. When stored on the roof, maintenance crews can repair the unit without getting in anyone’s way. HVAC units create a large amount of condensation which frequently needs to be drained. When it is on the ground, it can leak and cause potential accidents as well as an unsightly mess. Units on the roof do not have this problem, because any condensation can flow into the gutters and away from the roof. The weight of the HVAC unit can cause damage to your roofing membrane. In addition to this, if you have foot traffic around the unit, there will be additional wear and tear. During routine maintenance and installation, the membrane becomes damaged which may lead to leaks inside the building. When installing an HVAC unit of the roof always ensure it is done properly because if it is done in a hurry, you can end up with low spots which can lead to pooling. If there is pooling around the unit that is allowed to sit for days, the interior material of your roof can begin to deteriorate. When the unit is on the roof and out of sight, it can be easy to forget about its upkeep and maintenance. The condensation line from the unit can cause malfunctions if not checked regularly. Puddles can form across your roof and pooling water can cause mold and rot as well as leaks. Understanding the pros and cons of having your HVAC unit on the roof is essential so you can make the best decision for your building. While it is more practical to have these units on the roof, you must not forget that it is up there. With regular attention and maintenance, your rooftop HVAC unit and your roof will be just fine, and you won’t have any obstructions on your property.